I use my camera with the mode to save jpeg+raw. If I want to get skim through the pictures I always had twice the work (show jpg, skip raw) and sorting out (delete jpg and delete raw). IrfanView at least allows to skip the raw image with the keyboard shortcut <Ctrl>+2. Although the deletion process stays burdensome. Open the XnView-config file: %appdata%\XnView\xnview.ini (in my case C:\Users\alex\AppData\Roaming\XnView\xnview.ini). This links the .cr2 (raw-File) to the .jpg. So if you delete the jpg it automatically deletes the .cr2. Replace the cr2 with the extension of your raw-file (so eg nef for Nikon) and save the file. If you want the effect also in the other direction you have to create another newline: Companion_01=cr2:jpg. For now you can just leave this, as we will hide the raw files in the next steps. Start XnView and open the options (Menu: Tools > Options or via <F12>) and see also screenshots below. 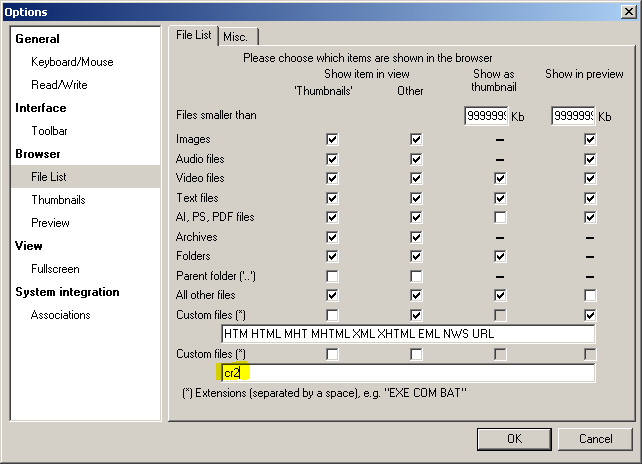 In Browser > File List write the file extension you want to hide (the raw file: in my case cr2) in the last text input and click the OK button. That is it. Now it should be easier to sort your pictures, as only the jpg-pictures are shown and if you delete it, the raw file automatically gets also deleted. Photography Stack Exchange: Simple app for viewing JPG and then deleting JPG+RAW files simultaneously? At work I have to use Windows 7 with Outlook 2003. We needed a solution to add the reply-to header to all outgoing mails. As out server uses Exchange 2003, Transport agents to change smtp headers are not supported. 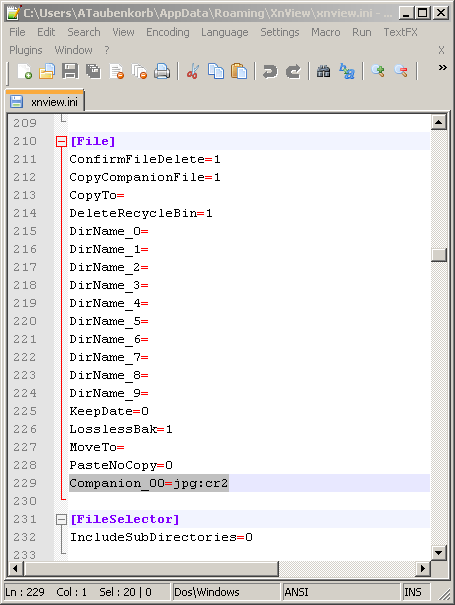 So I had to code a client (Outlook 2003) solution, because the add-ins cost about 50 $ per user. Because macros are “dangerous” you have to set the security level down. Open Extras → Macro → Security. For deployment I recommend you to sign the macro and then copy the the file %appdata%\Microsoft\Outlook\VbaProject.OTM to the new computer (this overwrites all macros on the new computer with the macros from the source computer). On the new computer you should install the signature (In the security warning on Outlook startup click Details → Show Certificate → Install Certificate and then restart Outlook and always trust the macros from that source. While I updated ubuntu from 10.04 to 10.10 my keyboard stopped working. Then I saw that the window borders were missing. So it seemed that metacity crashed. But how can I restart metacity without a keyboard? In your main menu click: System > Preferences > Appearance and change your Visual Effects from the current value to something else. That worked for me. Metacity restarted and the keyboard resumed its work.